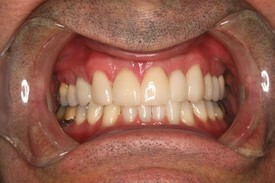 Chief Concern: Uneven teeth shape and dark metal showing under old crown. 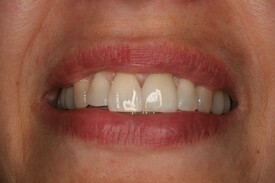 Treatment: An all porcelain crown and tooth colored fillings used to restore patients ideal archform and shade/color. Chief Complaint: "What are my options to disquise my dark tooth that had a root canal many years ago?" 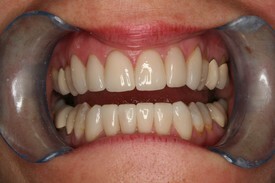 Treatment: An all porcelain partial crown was used to block out the dark color. 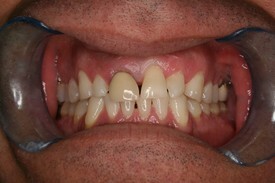 Patients Concern: "I have had these old crowns since I was in my 20's. They are starting to show a dark line at the gumline. Can theybe replaced with something that looks more natural." 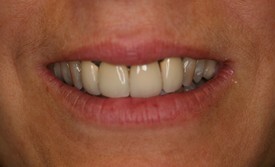 Phase 1: 4 porcelain crowns and 2 porcelain veneers restored the upper arch. 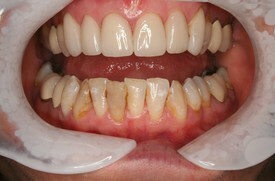 Phase 2: After using a removable appliance to move a tooth into alignment, 3 porcelain crowns and 3 veneers were used to restore the lower arch. 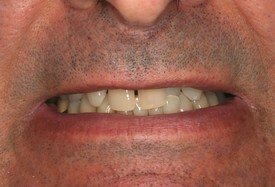 Patients Concern: "I have thought about closing the spaces on my front teeth for many years now. 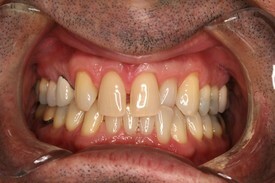 What can be done to fix this without doing orthodontic work? 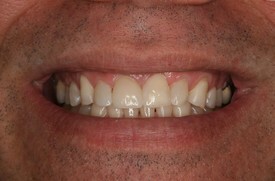 Treatment: 4 Porcelain Veneers and 3 porcelain crowns were used to close in all the spaces and give our patient a natural and full smile. Patient also went through ZOOM! 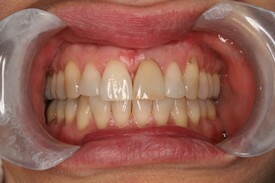 whitening on his lower teeth to match the new crowns. 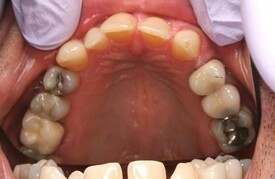 Patients Concern:" I have this old crown that looks too big and has a black line at the gumline. What can be done to give me a more naturally looking smile." 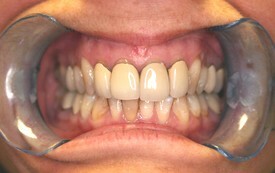 Treatment: An all porcelain crown was used to replace the old metal/porcelain crown and tooth colored composite fillings were bonded onto neighboring teeth to make his front teeth more proportional in size.